US Secretary of State Hillary Clinton has questioned Pakistan's failure to capture senior al-Qaeda leaders. Mrs Clinton said in an interview with journalists in Lahore she found it "hard to believe" nobody in the government knew where they were. She also challenged opposition to a US aid package, criticising Pakistan's investment levels and taxation system. Mrs Clinton will now head to the Middle East to try to kick-start the Israel-Palestinian peace process. 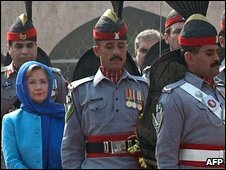 Mrs Clinton has been in Pakistan for two days trying to strengthen ties with the government, shore up the fight against militants and tackle rising anti-US feelings among the Pakistani people. In the interview with the journalists she was asked why Pakistan was seen as the centre of terrorism and why other nations could not do more in the fight against it. Mrs Clinton said: "The world has an interest in seeing the capture and killing of the people who are the masterminds of this terrorist syndicate. As far as we know, they are in Pakistan." She said: "Al-Qaeda has had safe haven in Pakistan since 2002... I find it hard to believe that nobody in your government knows where they are and couldn't get them if they really wanted to. "Maybe that's the case; maybe they're not gettable. I don't know." US Ambassador Anne Patterson said Mrs Clinton's remarks were similar to what the administration of President Barack Obama had told Pakistani officials privately. "We often say, 'yes, there needs to be more focus on finding these leaders'," Ms Patterson said. Mrs Clinton also bridled at criticism of a key US aid package for Pakistan. Earlier this month, President Obama signed into law a $7.5bn package, tripling non-military US aid to an annual outlay of $1.5bn for five years. "At the risk of sounding undiplomatic, Pakistan has to have internal investment in your public services and your business opportunities. "The percentage of taxes on GDP is among the lowest in the world... We (the US) tax everything that moves and doesn't move, and that's not what we see in Pakistan. "You do have 180 million people. Your population is projected to be about 300 million. And I don't know what you're gonna do with that kind of challenge, unless you start planning right now." Mrs Clinton had earlier held a lively discussion with about 200 university students in Lahore. She acknowledged there was what she called a trust deficit towards the United States in Pakistan because of past policies. But she said she was working to change that by reaching out to ordinary Pakistanis. Richard Holbrooke, US envoy for Afghanistan and Pakistan, said Mrs Clinton was to meet Pakistani army chief, Gen Ashfaq Pervez Kayani late on Thursday for a report on the anti-militant operation in South Waziristan. 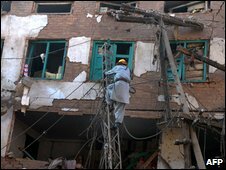 Mrs Clinton's arrival was overshadowed by a massive car bombing in the north-western city of Peshawar that killed at least 91 people and injured scores more. On Wednesday she said the attack had been "vicious and brutal", and that the US was "standing shoulder to shoulder" with Pakistan in its fight against the militants. Mrs Clinton is due in the Middle East at the weekend to meet Israeli Prime Minister Benjamin Netanyahu and Palestinian Authority President Mahmoud Abbas.